This character profile has been written for Belaq, one of our supporters. If you enjoy it, you can check out the other profiles we’ve written, too! It was the smell of cinnamon that brought it all flooding back. Sharp and sweet and wafting over the street near the canal, coming from any one of a dozen buildings around her. Belaq didn’t stagger or go into a state over it, but the awareness of how wrong everything felt overwhelmed her. The streets were too wide and paved with larger stones. The buildings were squat and unlovely, except for the Cathedral, and even that was lovely in a stark, angular way compared to the flowing towers of Silvermoon. And the people tended to crowd each other, as if concerns of dignity and space were alien to them. She knew this was unkind. Humans weren’t Elves, Stormwind was much younger than Silvermoon and so far most of the people she’d met since arriving had been pleasant enough. Some would ask questions she found tiresome, like why is your hair like that or are you okay, you look really pale but for the most part, the Humans, Dwarves and Gnomes were all welcoming enough. She’d even seen a few Night Elf refugees, and they fascinated her — taller, leaner, and more muscular than her people, yet exuding a kind of raw, feral grace that seems contrary to everything she thought of as Elven. Distracted by those memories she walked out of the Old Town and towards the park. 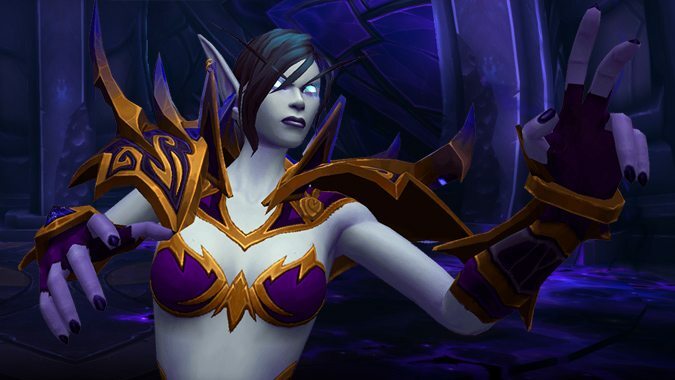 She’d been Horde because others had decided the Sin’dorei should be Horde, but she’d supported the decision — they’d needed allies to rebuild and reclaim their lands and while having the Forsaken so close had been troubling, at the time she’d trusted that Sylvanas must remember her roots as a defender of Silvermoon. It hadn’t been that long ago, really, and yet it felt like centuries. Some children ran by, intent on some game they were playing. One of them was a Draenei, and that surprised her. She’d never seen a young Draenei before. The park was lovely enough, if dominated by the memorial to the slain King. She lingered there. She’d thought herself retired after the Pandaria campaign — her memories turned back to her mother, as graceful as always, her fingers kneading dough without ever getting any stuck to her in a way that had frankly astonished Belaq, and that kitchen redolent with pleasant smells, especially the cinnamon. She neither gasped nor sobbed at the pain of that memory, how she might never see her mother or father again, never see that little bakery in Silvermoon. She could hear whispers at the edge of her thoughts, and knew if she tried she could make them out. Alleria said that it was best to refuse to give them your attention. They were helpless to harm you unless you listened to them. Umbric… well, he’d always been a bit more reckless then Belaq had liked, even back before the Telogrus Rift and the Ethereals and the change. But they were what they were, and sitting in the park staring at a dead King’s memorial wouldn’t change it. She’d fought demons on Argus, been made something new, had lost her home and her people and come to this strange new place and the whispers were maddening even when she couldn’t make them out. Perhaps because she couldn’t. She wondered if the dead King would have any advice for her. From what little she knew of him, he was a fighting sort. Perhaps he’d tell her to get up, stop feeling sorry for herself, and fight. After Argus, she was very tired of fighting. She’d been tired of it well before, to be honest. Her fingers itched with the memory of rolling that dough around the cinnamon, of cutting each roll just so — even mother couldn’t make them tighter than Belaq, it had been a source of pride. After years of calling on the Light to heal sisters and brothers in arms, it had been so nice to just be. Not to be a soldier in the Horde war machine, not to call down the wrath of the Light to smite her enemies or pull upon its grace to close their wounds. She shook her head. Felt Shadow crawling up her arm, the power right there for her to use it, all she had to do was reach out. Ever since the change she could touch it with such ease it shocked her. When she’d trained as Priest, back before the Scourge, the Light had come just as easily, but after Arthas it had been a struggle. She’d lost her faith for a while, only reclaimed it with effort and it had never been as easy as this was. This was power that wanted her to use it. Alleria always said mind the cost in everything and she wondered at that now. As Ren’dorei she was something else, something she still didn’t understand. Finally she left the dead King to his rest. It was a new world she found herself in, but she’d smelled cinnamon. It wasn’t all changed. Perhaps she’d find a bakery, see if she could get a roll. Or perhaps she’d go make her own and show these new people how it was done.